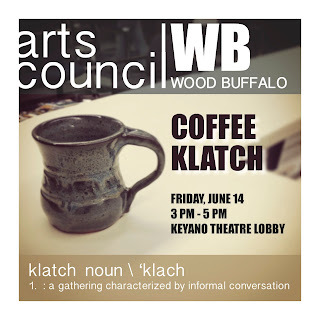 I'm not sure why the term "klatch" popped into my head as I started thinking of a community engagement strategy related to Arts Council Wood Buffalo (ACWB). Starting with a gathering characterized usually by informal conversation (Merriam-Webster), seemed like a good first step to answer the many questions that we know are out there, floating on the breeze about ACWB, and capturing your ideas, needs and dreams. There are some things we know and many things we don't. This organization is really in its early stages, though our intention is to move forward with mindful haste and careful abandon. Having an open and ongoing dialogue with citizens who are passionate about arts and culture is vital. We will gather for our first Coffee Klatch in the lobby at Keyano Theatre & Arts Centre on Friday, June 14th between 3 pm and 5 pm. No agenda. No pre-ordained talking points. No pressure. Drop in whenever it's convenient. The only thing we're going to ask of you is to fill out a quick form so that we can connect beyond the Klatch. I'm also excited to pass out my temporary business cards so you can connect with me in my new role. You get to pick between one of five cards featuring some of my portraits. Which one is your favourite?